The Money Management 1-2-3 PowerPoint training file is available for download in the "Download File" section. 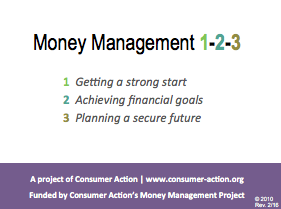 This publication is part of the Money Management 1-2-3 training module. © 2010 –2019 Consumer Action. Rights Reserved.